BANGI, 12 Dec 2013 – There is a need to rethink the purpose of university education if universities are expected to produce graduates who can steer the future with wisdom and integrity. A Physicist from The National University of Malaysia (UKM), Prof Mohd Yusof Othman said universities all over the world are only producing graduates with the hardware but lacking in the ‘heartware’. Prof Yusof who is also the Director of the Institute of Islam Hadhari (Hadhari) in his keynote address at the Symposium on Teaching and Learning here today said higher institutions of learning needed to also take the spiritual values into account if they want to produce graduates not only armed with skills but also with soul needed to attain greatness. He said educators were now missing the point of educating the younger generation. Illustrating his point, he said there were many graduates in the banking industry who were considered successful. Unfortunately those with the education had used their knowledge and motivated by greed had brought down some banks. This can be seen with the demise of the Lehman Brothers Investment Bank, a bank that had survived for hundreds of years. There were also many other banks which suffered the same fate due to the greed of the graduates in their employ, he said. Such graduates had been churned out because the objective of education to create an exemplary human being had been forgotten. “Yet many great people are those like, Einstein, Bill gates, Steve Jobs and even David Beckham who are all dropouts.” These are the people who can employ graduates and create opportunities for those with university education. Without a set of values like honesty, integrity and a sense of accountability, universities are turning out potentially highly skilled crooks. Universities had failed to produce graduates who have values because educators are not judged on their ability to produce graduates who are honest, God fearing and guided by integrity but are obsessed with pedagogy and procedures because they are judged on those factors. Thus things like ISO and KPI have now become the objective of educators; sadly these rarely take the human soul into account since honesty and other values of the soul cannot be measured by the Key Performance Index, Prof Yusof said. He partly blamed development in information technology in the last 20 years for such a situation with educators being obsessed with new teaching approaches that use information technology. There is nothing wrong with this but educators must not make these their teaching objectives, this is just a mean to an end. “As a result we can time the landing of our spaceship to the fraction of a second but we can’t control the fumes from our cars and factories. “This is because the very thing that activate values which is a natural characteristic in humans is cut from education. Religion has no place in science. 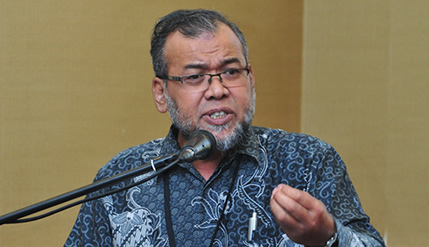 This is an obsolete idea when it comes to Islam,” Prof Yusof said. The Quran does not just coincide with scientific discovery; it should be the basis to guide scientific research. The one day Symposium was organised by the Faculty of Science and Technology (FST) UKM to evaluate teaching and learning in the Faculty. FST Dean, Prof Dr Sharim Hj attended the symposium.